Nichola Drake has a special reason to celebrate St. Patrick’s Day. Not because she’s Irish. Not because she loves corned beef. Not because it’s an excuse to wear green. It’s because she’s lucky. Lucky to still be here. On St. Paddy’s day in 2016, Drake was with her brother on spring break in Mexico when she fell off the back of a Jeep in the desert while documenting the ride on Instagram. Her severe head injuries and broken hip required a year’s worth of hospitalization, round-the-clock home care and several forms of rehabilitation. 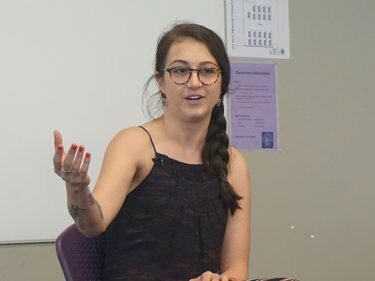 As Drake has done a handful of times for Grand Canyon University adjunct instructor Ted Telepak, her rehab coordinator and director of vocational rehabilitation at Rehab Without Walls in Phoenix, the 23-year-old shared her story and answered questions from College of Education students Thursday. “I’m often terrified of public speaking, but speaking to kids who are close to my age helps bring the intimidation down,” she said. She lost nearly all use of the left side of her body – “like I had two massive strokes” – and, after months in the hospital, moved back in with her father because she couldn’t be left alone for more than a couple of minutes for fear of seizures. “That was the worst,” she said. 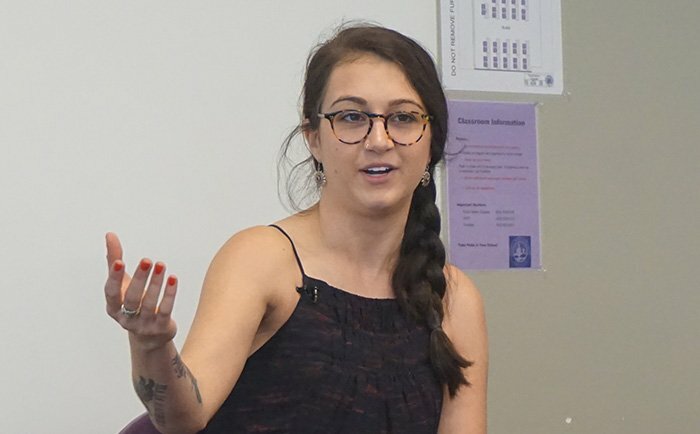 Until she “graduated” last week, she went to some form of rehab at either Barrow Neurological Institute or with Telepak at Rehab Without Walls, up to three times per day, five days per week while being cared for 24/7 by her father at home. For months she couldn’t text with two thumbs. Speech and movements were ragged and broken. And she couldn’t drive. “I just wanted to go to Target,” she said. Very few clues of her accident and recovery can be seen on her skin anymore, but they’re below the surface. Teaching future teachers, some of whom might teach special education down the road, is one of several reasons why Telepak invites Drake to speak in his classes. Empathy and understanding of both others’ plights and those we experience ourselves outweigh textbook teachings in Telepak’s classroom. After she answered questions from students on Thursday, each student shared what they heard, saw, felt or related to with Drake’s story. “They’ll never treat a disability unless they get to know the person,” Telepak said. “I don’t want regurgitation, I want relevance. Having fallen hard and clawed her way back toward semblance of a normal life again, Drake’s back for a fifth year working at Matt’s Big Breakfast, currently at the Biltmore location, and is taking a class at Phoenix College. Counseling young adults has become her “launch” for her future, an intentional word choice considering the irony of being “launched” off the Jeep. Surviving the accident ultimately helped her find her calling. Her brother was erroneously charged with attempted homicide in Mexico, but his legal issues have been fully cleared. She says she’s mentally and emotionally closer to her brother than ever before and, with no hesitation, placed the onus on herself for what happened. “Lost” was her description of 2016. “Independent and found” is her 2017.